Well, we’re back…vacation was stressful, but not for the reasons I anticipated. I was concerned about Ryan’s safety aboard the cruise ship and being on the water. That proved not to be nearly as worrisome as I had thought. What was a challenge, however, was finding foods for him to eat that he isn’t allergic to. Ryan is allergic to all of these, and many more! Ryan has so many food allergies…in fact, it’s easier for me to tell you what he’s not allergic to—chicken, beef and lamb. He is allergic in varying degrees to EVERY OTHER FOOD. You name it—milk, eggs, yeast, soy, wheat, fish, shellfish, tree nuts (e.g., pecans, walnuts, pistachios, etc. ), peanuts and legumes (peas, lentils, beans), other vegetables and fruits, and even slightly to pork. Obviously we have to feed him something so he eats foods he’s less allergic to, such as rice. However, putting allergens into his body results in horrible eczema—his skin sometimes looks as if it’s been burned. Ryan suffers from itcy, oozing eczema all over his body. So what causes all these food allergies? I could start with the very beginning—I firmly believe the adjuvants in his vaccines hyper-stimulated his immune system. The adjuvants in vaccines—usually Aluminum Hydroxide—are there to provoke your body into a strong immune response. Adjuvants are present in vaccines where live-virus is not used, which is most of them. The MMR shot does not use an adjuvant, for example, because it contains live virus. 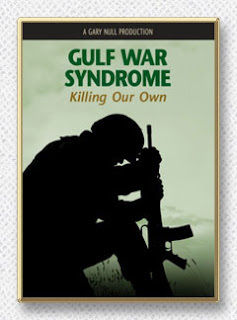 I could go on to discuss how Aluminum Hydroxide is a known neurotoxin1,2 and has been implicated in Gulf War syndrome3, but that’s a topic for another day. There is a lot of research about the neurotoxicity of the adjuvants used in the anthrax vaccine our soldiers get. The problem with adjuvants though is in some people they are too stimulating and put the body’s immune system on high-alert such that the body mounts a nuclear response to anything it perceives as a foreign invader. This is where the “Leaky Gut” comes into play. A leaky gut is the hyper-permeability of the intestinal lining, which allows for unwanted bacteria and toxins, incompletely digested food proteins and fats, and even waste not normally absorbed into the bloodstream to “leak” out of the intestines and into the bloodstream. The body, recognizing a foreign invader mounts an immune response resulting in chronic inflammation, and food allergies and sensitivities—in other words, autoimmune disease. 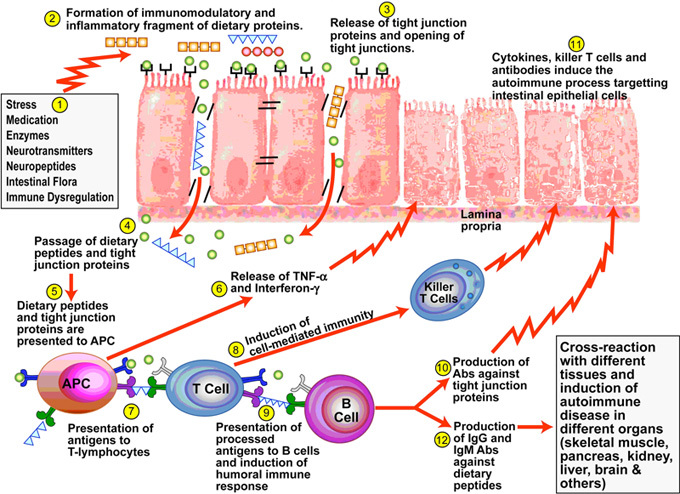 Autoimmune diseases are characterized by “tissue damage and loss of function due to an immune response that is directed against specific organs…the intestinal epithelial barrier, with its intercellular tight junctions, controls the equilibrium between tolerance and immunity to non-self antigens”4. Ryan has a leaky gut resulting in autoimmune diseases. 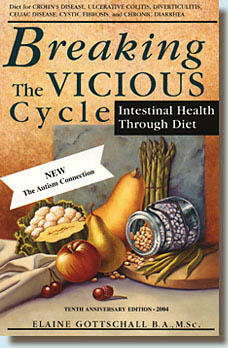 In other words, the lining of the intestine is damaged, and equilibrium is offset resulting in a “Leaky Gut”. Ryan is a textbook case of leaky gut. Anytime I’ve introduced a new food he’s become allergic to it. His immune system operates in overdrive all day, all the time. I never know when a reaction to food is going to result in an itchy rash or a stronger reaction. Leaky gut is not a new theory. I just read a paper from 1996 entitled, “Abnormal Intestinal Permeability in Children with Autism”, which determined the occurrence of gut mucosal damage was found in 43% of the autistic patients who took part in the study. The authors speculated an altered intestinal permeability could represent a possible mechanism for the increased passage through the gut mucosa of peptides derived from foods and the “leaking” of these peptides into the bloodstream is what causes behavioral abnormalities in autistic children by stimulation of opioid-like receptors5. If I might digress for a moment, the opioid-like effect produces that “zoned-out” appearance in many autistic children—this effect became the basis of trying casein-free (milk and its related products) diets for autistic children. Gluten, a protein found in wheat and other grains, can have an inflammatory effect in some people—celiac disease is a severe case of gluten intolerance—which is why a gluten-free diet is recommended for autistic people. 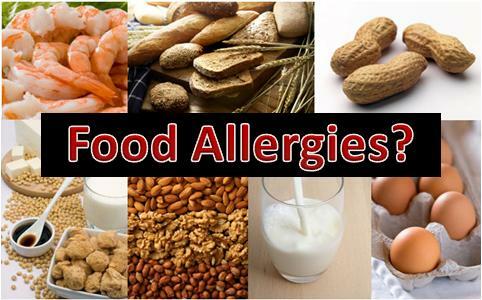 But back to the topic at hand…these extreme food allergies are caused by the leaky gut. It’s been pooh-poohed for years, but research is beginning to confirm that the theory is correct. The treatment for leaky gut is to heal the intestinal tract, and there are several diets that have been designed to just that…these diets also work wonders for Crohn’s disease and Irritable Bowel Syndrome. Perhaps the best-known is the Specific Carbohydrate Diet, or SCD, which is grain-free, sugar-free, starch-free and unprocessed. There is hope...if only I could make this work for Ryan. As much as I would love to put Ryan on this diet, which I believe would heal his gut and eliminate much of the allergy issues, it’s a vicious cycle. He is allergic to nearly all the foods on the diet, which means he can’t go on the diet, which means he continues to accumulate allergies. In the meantime, I feed him foods he is only mildly allergic to and hope for the best. 1 1. Shaw, C. A. & Petrick, M. S. (2009). Aluminum Hydroxide Injections Lead to Motor Deficits and Motor Neuron Degeneration. Journal of Inorganic Biochemistry, Vol 103, pp 1555 – 1562. 2. Tomljenovic, L. & Shaw, C. A. Do Aluminum Vaccine Adjuvants Contribute to the Rising Prevalence of Autism? Journal of Inorganic Biochemistry, Vol 105, pp 1489 – 1499. 3. Petrik, M. S., Wong, M. C., Tabata, R. C., Garry, R. F., & Shaw, C. A. (2007). Aluminum Adjuvant Linked to Gulf War Illness Induces Motor Neuron Death in Mice. NeuroMolecular Medicine. Vol. 9, pp 83 – 100. 4. Fasano, A. (2012). Leaky Gut and Autoimmune Disease. 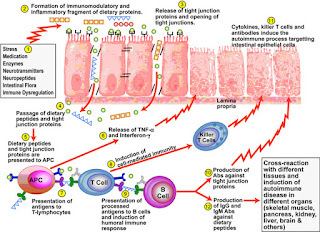 Clinical Reviews in Allergy & Immunology, ISSN 1080-0549. 02/2012, Vol. 42(1), 71 -78. Snoring Center Dallas Our Sleep Medicine Dallas, Snoring Center Dallas and Snoring Dallas services are always open for our clients and available 24 hour a day. My son also showed signs of autism. After removing red/yellow lentils (dal), he stopped showing autism symptoms. 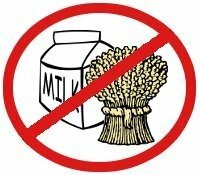 He's also allergic to dairy and wheat.